TRANS-Tainer has released a new version of its RTM series viscous liquids Liqua-Tainers for inks, greases, adhesives and pastes. The RTM has been designed from the ground up to ensure maximum service life, pumping assistance and product integrity in severe operating conditions. The unique field proven follower system has been upgraded to 35kPa operation which provides additional pumping assistance when dispensing tacky and viscous products. The pneumatically driven follower force feeds product to the inlet port of the pump whilst operating as a flexible wiper, removing product from the walls during decanting to minimise residual and cross contamination concerns. By encapsulating the product on the underside of the follower with only compressed air being injected, contamination is kept to an absolute minimum. An external level indicator is fitted to show real time contents. The RTMs are bottom fill and bottom discharge via a full bore 3" ball valve to ease suction restrictions. The RTM footprint is based on a standard pallet size to simplify loading into containers and onto truck trays. The skid base has been upgraded to allow four way forklift entry using fully enclosed forklift pockets for operator safety. 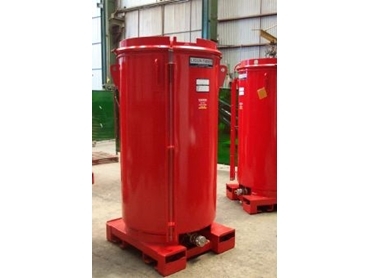 Areas subject to forklift damage have been heavily reinforced with guard and striker plates. The RTM series is available in 750, 1000, 1200 and 1450 litre capacity. Accessories include pneumatic regulators, lifting lugs, dry break adaptors, pump spear adapters and unloading stands. Trans-Tainer 08 8363 9799.